Scafell is the second highest fell in the Lake District, and can be surprisingly quiet on days when its bigger brother Scafell Pike is crawling with walkers. It can also be just out of the clouds on days when the top of the Pike is poking up into the fog. Scafell is very different on each side. To the west the fell has one long smooth slope that runs down as far as Wast Water. To the south a long ridge runs from the summit to Long Green and Slight Side. The fell then drops down into a series of interesting crags and coves that eventually end at Wha House in Eskdale. The exact moment where Scafell ends in this direction isn't at all clear. To the north the impressive Scafell Crag faces across Hollow Stones towards Lingmell, and stands over Mickledore. For me the eastern side is most dramatic, with a series of crags that drop down to the upper reaches of the River Esk, making up a key part of one of the wildest areas in the district. There are four main routes up Scafell. Two begin in Eskdale. The longer route follows the Esk into its upper reaches, before turning west from Great Moss to climb up towards Mickledore. Before reaching that iconic pass a path branches left to Foxes Tarn, from where a path leads up to the summit ridge. The second route comes up over Slight Side, the southern end of the longer summit ridge. Slight Side can be reached along a beautiful path that starts at Wha House, or from Boot via a path that runs past Eel Tarn and Stony Tarn. The third route is best used from Wasdale Head, although is possible from Eskdale. This path runs up the long steep western slope of the fell (never quite as steep as it looks), starting from the path that runs from Wasdale to Burnmoor Tarn, eventually running up the top of Scafell Crags to reach the summit. The fourth is the hardest, and isn't always open. Once again we start in Wasdale, and follow the Brown Tongue route. Soon after crossing Lingmell Gill branch right onto the path to Mickledore. Just before reaching that pass we reach the start of Lord's Rake, which cuts through Scafell Crag. Two of our walks ascend Scafell - one from Wasdale via the western slope and one from Wha House in Eskdale. I feel that Scafell has a better summit than Scafell Pike. The top of the fell forms a horseshoe above the tiny Foxes Tarn. The main summit is at the bend in the horseshoe. A rocky spur heads south towards Eskdale, but the more interesting part in the northern spur, which drops down then rises up to Symonds Knott, a rocky outcropping that looms above the impressive Scafell Crag. A path leads from the main summit towards the Knott, then continues on towards Scafell Pike, but be aware that this is a dead end, heading towards Broad Stand, a climbing route not a walker's route. Scafell is bound by some frustratingly un-named becks. On the Eskdale side an unnamed beck runs down from Mickledore, eventually joining How Beck before flowing into the River Esk. The Esk itself forms the eastern boundary. To the south Scafell ends in rather confused ground, but can claim Cowcove Beck. 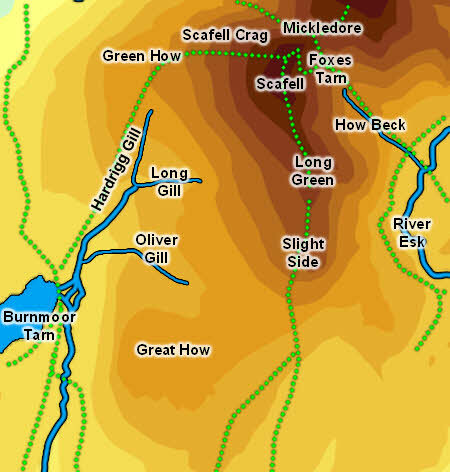 Quagrigg Moss is the south-western boundary, dividing Scafell from Great How. Oliver Gill, which runs out of the Moss, runs into Hardrigg Gill, which is born on the western slopes of Scafell (as does Long Gill, which joins Hardrigg Gill further up). The combined streams join Whilllan Beck just downstream of Burnmoor Tarn. To the west an unnamed beck flowing south and Straighthead Gill running north form the boundary with Illgill Head. Groove Gill and Hollow Gill are born on the western slopes of Scafell, flowing towards Wast Water. Lingmell Gill forms the northern boundary with Lingmell, although in Hollow Stones more un-named becks form the actual boundary. Scafell can claim all of Foxes Tarn, a tiny pool of water to the east of the summit. It also has a rather swampy footing on Burnmoor Tarn and there are a number unnamed tarns in Quagrigg Moss. Scafell is unusual in that there is no direct ridge route across to Scafell Pike. Broad Stand blocks the way, and so any walker who wants to go from one to the other needs to drop down either to Foxes Tarn or to Lord's Rake, then climb back up to Mickledore and from there up to Scafell Pike.